Geomagnetic excursions represent short episodes that last a few thousand years at most during which the field considerably exceeds its normal range of variability during a polarity state. The Laschamp event discovered in lava flows of Massif central (France) is the youngest and the most studied field excursion. Its geomagnetic origin has been controversial due to the existence of self-reversal processes. We have confirmed that reverse polarity flows are affected by self-reversals, but we found that this is also the case for normal flows. A direct consequence is that self-reversals cannot be taken as responsible for the reverse directions. We sampled a large collection of flows. New K-Ar dates by Gilles Gu�rin provided a coherent chronology of the successive polarities. The 37 ka old reverse directions of the Olby flow are consistent with the 41.9 kyr old normal polarity flows preceding the event. A younger flow with intermediate directions dated at 33.3 ka may be related to the Mono Lake event. Surprisingly, no attention has been given to the fact that the Laschamp and Mono Lake events occurred during the period of Neandertal extinction (this is even clearer after recalibration of the 14C ages) which lasted for several thousand years. During this time interval the geomagnetic field strength was considerably reduced and shielding efficiency of the magnetosphere lowered, leaving energetic particles reach latitudes as low as 30�. The enhanced flux of high-energy protons (linked to solar activity) into the atmosphere yielded significant ozone depletion down to latitudes of 40-45�. A direct consequence was an increase of UV-B radiations at the surface by at least 15-20% in Europe with significant impacts for human populations. With Hne Valladas we suggest that these conditions, maybe added to other factors, have contributed to the demise of Neanderthal population. Link between the Laschamp event and Neandertal demise (Quatern. Sci. Rev. 29, 2010). [Recalled Dream] The ground floor stood for the first level of the conscious. The deeper I went, the more alien and darker the scene became. In the cave (under the house), I discovered the remains of a primitive culture, that is, the world of primitive man within myself - a world that can scarcely be reached or illuminated by consciousness. The primitive psyche of man borders on the life of the animal soul, just as the caves of prehistoric times were usually inhabited by animals before men laid claim to them. ~Carl Jung; Memories Dreams and Reflections; Page 160. A new genetic study, published in the journal Genetics, supports the hypothesis that Neanderthals interbred with anatomically modern Homo sapiens in Eurasia. The first scenario is that Neanderthals occasionally interbred with modern humans after they migrated out of Africa. The alternative scenario is that the humans who left Africa evolved from the same ancestral subpopulation that had previously given rise to the Neanderthals. Many anthropologists say the interbreeding scenario is more likely, because it fits the genetic patterns seen in studies that compared genomes from many modern humans. By using only the information from one genome each of several types: Neanderthal, European/Asian, African and chimpanzee, Dr Lohse with colleagues completely ruled out the alternative scenario, revealing strong support for Neanderthal admixture in Eurasia at a higher rate (3.4-7.3 per cent) than suggested previously. The method can more confidently detect the genetic signatures of interbreeding than previous approaches. In fact, the researchers originally developed it while studying the history of insect populations in Europe and island species of pigs in South East Asia, some of which are extremely rare. Dr Lohse also said the new method estimates a slightly higher genetic contribution of Neanderthals to modern humans than previous studies. “This work is important because it closes a hole in the argument about whether Neanderthals interbred with humans,” said Editor-in-Chief of the journal Genetics Dr Mark Johnston, who was not involved in the study. New research raises questions about the theory that modern humans and Neanderthals at some point interbred, known as hybridization. The findings suggest that common ancestry, not hybridization, better explains the average 1-4 per cent DNA that those of European and Asian descent (Eurasians) share with Neanderthals. Dr Andrea Manica, from the University of Cambridge, who led the study said: "Our work shows clearly that the patterns currently seen in the Neanderthal genome are not exceptional, and are in line with our expectations of what we would see without hybridisation. So, if any hybridisation happened -- it's difficult to conclusively prove it never happened -- then it would have been minimal and much less than what people are claiming now." About 1.5 to 2.1 percent of all people with European ancestry can be traced to Neanderthals. Only 96 genes responsible for making proteins in cells are different between modern humans and Neanderthals. Intriguingly, some of the gene differences involve ones involved in both immune responses and the development of brain cells in people. Somewhere within these 96 genes may lay the answer to why Neanderthals and Denisovans became extinct. The study really highlights that no race of people on earth belongs to one ancestral group, rather we all have “proportions of ancestral groups," said computational biologist Rasmus Nielsen of the University of California, Berkeley. What’s more, we can begin to contemplate the fact that we are all “connected to other species - extinct smart bipeds”. “The fact that Neanderthals in Europe were nearly extinct, but then recovered, and that all this took place long before they came into contact with modern humans came as a complete surprise to us. This indicates that the Neanderthals may have been more sensitive to the dramatic climate changes that took place in the last Ice Age than was previously thought”, says Love Dalén, associate professor at the Swedish Museum of Natural History in Stockholm. There are several points that come to mind, from the specific to the general. First, from what I gather Neandertals were actually less expansive in pushing the northern limits of the hominin range than the modern humans who succeeded them. From this many suppose that despite the biological cold-adapted nature of the Neandertal physique they lacked the cultural plasticity to push the range envelope (e.g., modern humans pushed into Siberia, allowing them to traverse Beringia). One might infer from this that Neandertals were more, not less, sensitive to climate changes than later human populations. Second, there is the fact that as the northern hominin lineage one would expect that Neandertals would be subject to more population size variations than their cousins to the south during the Pleistocene due to cyclical climate change. This is not just an issue just for Neandertals, but for slow breeding or moving organisms generally. The modern human bottleneck is in some ways more surprising, because modern humans derive from a warmer climate. Finally, there is the “big picture” issue that though we throw these northern adapted hominins into the pot as “Neandertals,” one shouldn’t be surprised if they exhibit structure and variation. Non-African humans have diversified over less than 100,000 years, at a minimum the lineages which we label Neandertals were resident from Western Europe to Central Asia for ~200,000 years. Wouldn’t one expect a lot of natural history over this time? Presumably the authors focused on mtDNA because this is copious relative to autosomal DNA, making ancient DNA extraction easier. I’m a bit curious how it aligns with the inference from the Denisovan paper that Vindija and Mezmaiskaya Neandertals both went through a population bottleneck using autosomal markers. The dates from the paper’s supplements are not clear to me, though it seems possible that they may have sampled individuals where the Vindija population may have been post-resettlement. At some point presumably we may be able to get a better sense of the source population of the Neandertal admixture into our own genomes if the genomic history of this population is well characterized. February 26th, 2012 at 11:23 pm Nice map, it helps a lot to see the big picture. The only thing that this says is that the late West Neanderthals of Feldhofer, Vindija and El Sidrón were, matrilineally, descendants from a single population, which was distinct from their geographic predecessors of Valdegoba and Scladina but closely related to the “old school” Neanderthals from Italy. It can therefore be imagined that West and Central Europe were re-colonized from Italy (or maybe the nearby West Balcans). Instead Caucasian and Altaian Neanderthals retained their distinct lineages. We lack info from the late Southern Iberian Neandetrhals, which I would imagine more archaic than their continental neighbors (but just a guess). Feldhofer is characterized by a Micoquian culture (big almond shaped axes, often, but not in this case, intersped with Mousterian). Vindija and El Sidrón are both Mousterian. I say because I was kind of expecting this bottleneck to be related to Chatelperronian or other early UP techno-cultural expansion but there’s lack of data on that, I realize now. Whatever the case the appearance is of a population replacement by Neanderthals on other Neanderthals with an Italian or Balcanic source. As Onur says, it is at least curious that those dates are already within the probable time-frame of H. sapiens penetration in Europe: Istallosko, the earliest Aurignacian site, is 47.7 calBP, 44.3 BP uncal., with even older “aurignacoid” dates existing in Swabia and a number of other loosely “aurignacian” sites at the Pyrenees, South Germany, etc. before 45 Ka calBP. There is a modern (H. sapiens) individual dated to c. 55 Ka BP (OSL, stratigraphy) in Palestine (Emirian culture, considered precursor of other “Aurignacoid” groups). So we must realize that Neanderthals were already interacting with “us” since very early, even in Europe itself. I have a hard time with the authors’ interpretation. It all hinges on a very small number of early western specimen, and their dating. If one believes the timing, there was an expansion of the tight group (blue in the figure) ~60,000ya. The other branches may very well have expanded, too – we have simply insufficient data prior to ~42,000ya. Now, all or nearly all of the finds of the tight group are dated to when AMHs were already present in the region. Since the expansion occurred well beforehand, I don’t see a bottleneck, but rather a very strong selection event. Could this group have had physiological features that spared them? Were they resistant to newly brought-in diseases? I also miss a discussion of the archeological context. Surely, instead of relying on the very few specimen we have, one should compare to known sites and occupation timings. IIRC, there indeed were expansions at some sites ~60,000ya and shortly before AMHs arrived. February 27th, 2012 at 11:28 am I go into pop-sci articles expecting speculative scifi. February 27th, 2012 at 8:32 pm ~50 years ago??? February 27th, 2012 at 11:29 pm Since the expansion occurred well beforehand, I don’t see a bottleneck, but rather a very strong selection event. Could this group have had physiological features that spared them? Were they resistant to newly brought-in diseases? i don’t understand what you’re trying to say. you don’t consider a selection event a bottleneck? Perhaps I am misunderstanding something here, but my reading of the authors indicates that they place a bottleneck just before the expansion @ ~60kya — ~15-20ky before what I see as a selection event. My argument is that while there may have very well been a contraction (expected ~70ka-60ka ago due to climate), there are noteworthy logical fallacies, here. Firstly, there is a strong ascertainment bias: the vast majority of specimen from which mtDNA has been extracted is of course the most recent material (<42kya). If, on the one hand, the analysis indicates a population expansion 60-50kya, but on the other hand we have almost no data from that time period nor from the time until 42kya, then we cannot say much about the makeup of the population during that time. Lacking that, a reasonable *conjecture* would be that *all* then-existing branches expanded – because the one that we *have* data from shows this pattern. Then, the only conclusion one is left with is that – although somewhat plentiful – all but the "blue" branch vanished with the arrival of AMHs. That's selection – not a bottleneck, at *that* time. And note – I am usually extremely cautious about selection. In other words, envision figure one with another pink and green and yellow tree (think "little boxes" song), similar to the "blue" lineage – except the other ones didn't make it past 42kya. It's like our Sun or planets or Saturn's ring syndrome: we are hardwired to initially think – based on a single data point – they are exceptions – until we realize they are not. Neanderthal + Denisovan Family Tree. In a conference about the neanderthal genome, Carles Lalueza told to us that neanderthals didn't seem to come only from one group of hominids, because looking at their genome(s) they found that they came at least from two different groups, one of them being more closely related to us (modern humans) and the other diverged from our line earlier. It seems that neanderthals' ancestors mixed with other archaic groups when they left Africa, although we don't know when and where. It is possible that they come mainly from a group who diverged from us about a million of years ago, but then, once in Europe/Asia, these archaic hominids mixed again with another group of hominids more akin to us? This may explain why neanderthals are anatomically quite different from us, but genetic information tell us another different history. I hope so, it'd be very interesting to sequence more genomes from neanderthals and modern humans, but unfortunately the Neanderthal genome project already finished. Antigen analysis suggests that modern Homo sapiens mixed with Neanderthals three separate times in different places, and with groups of Neanderthals that were more primitive or advanced relative to each other. Below is the initial DNA analysis chart showing how different Neanderthals were to the rest of us. The two curves do have a small degree of overlap in the zone marked between 15 and 20 genetic differances. Neanderthals by Zdenek Burian. Below, Specific points of difference in the Neanderthal skeleton. 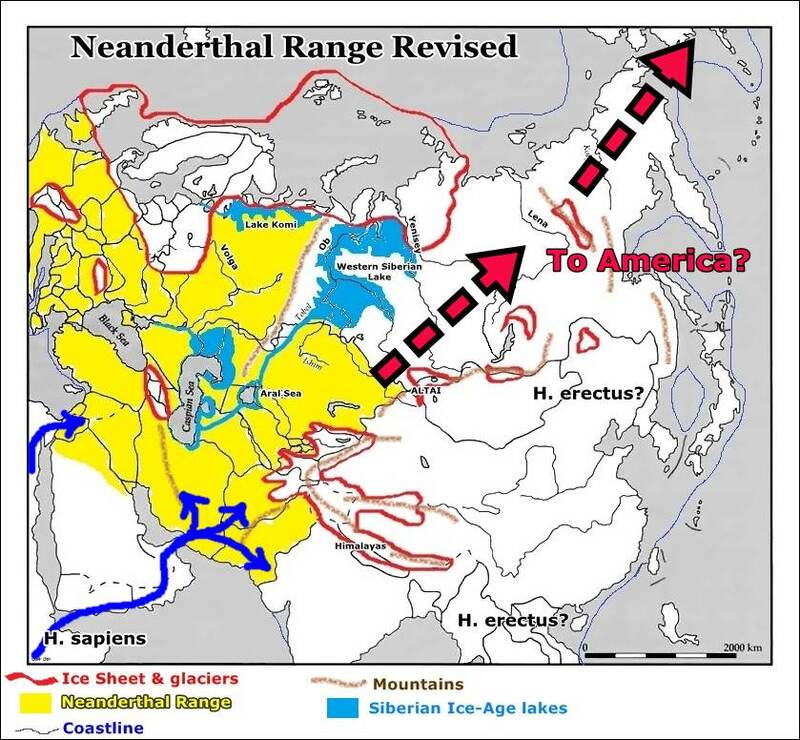 Neanderthal distributions: basically Neanderthals inhabited the warmer zones to the South, below the tree line during the Last Ice Age: they also inhabited the tundra areas here marked Western Palearctic and Central Palearctics they seem to have lived by following the herds of herd mammals, picking off scavengers and finding winter kills. Below, the tree line in the Mediterranean area. Below, areas of late-persisting Neanderthals around the European Fringe, Western Neanderthals. Eastern Neanderthals also persisted to this larte date (approx 25000 BC or later) in the Caucasusl Siberia and in the Mountainous regions of Central Asia. These areas are of interest because they are also areas from which eminate more recent reports of Wildmen. The black sanctuary areas indicated below were not supposed to have persisted nearly so long. The following charts are from Austin Whittal's Patagonian Monsters site anvokithat Neanderthals might very well have headed into the Americas at an early date, possibly in reaction to the movements of humans Out of Africa in the era of 65000 to 35000 BC. Thcates the expansion of Neanderthal territories Eastward and the solid yellow indicates the area they were "Classically" said to inhabit.